Remember THIS post about Adam Hiemenz (1839-1924), the altar builder at Holy Angels in St Cloud? 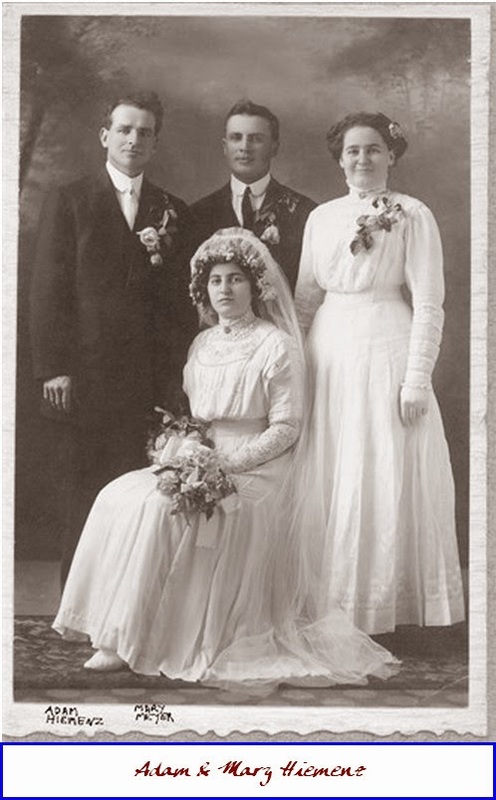 He and his wife Rose Bolfing had four kids, one of whom was Joseph Hiemenz, who married Gramma Lizzy's sister Angie Sand....here's another son named Adam Frank Hiemenz (aka Eddie) and his wedding to Mary Ann Meyer. I'm mortified to admit that I don't recall who sent it to me, but it needs a place here, even tho they made their home in St Cloud. They had eleven children and....wait, read Adam's obit, below. My families' double connection to the Hiemenz family is mentioned there. A.F. Hiemenz, Eddie's Market Founder, Dies. Adam F. (Eddie) Hiemenz, 86, founder of Eddie's Market here, died today. He had lived at 723 4 Ave. S. Mr. Hiemenz was a partner in Hiemenz and Rieter Grocery from 1905 until 1933. He worked for Warren Co., 1933-35, and Aug. 1, 1935 opened Eddie's Market, 115 7 Ave. S. Mr. Hiemenz was a 50-year member of the Knights of Columbus, Catholic Order of Foresters and St. Joseph's Society. He is survived by his widow Mary, and the following children: Herbert, Newport News VA; Mrs. C.V. (Alvina) Evans, Mercer Island WA; Mrs. Roy (Viola) Mallery, Palm Desert CA; Nestor, Mrs. Ed (Mercedes) Brandl, Mrs. George (Genevieve) Rosenberger, Roger, Roman and James, St. Cloud; Mrs. William (Lorraine) Travers, San Jose CA; Mrs. Vern (Rosemary) Vroman, Ingleside IL; Richard, Eden Valley MN; and Delroy, Warren MI. There are 53 grandchildren and 27 great-grandchildren.